This event to kick off the July NCAA Viewing period, certainly had an international flair. Teams from Canada and Australia joined the programs from up and down the West Coast to showcase their skills. These additions to the tournament had colleges coaches from all over clamoring about wealth of talent in the tournament. Local colleges like Claremont to college as far away as the University of Fairbanks, joined schools like Clemson, Pac 12 schools, like Arizona, Colorado, Oregon, and final four team Oregon State, to scan the wealth of talent that showed up at the Cal Storm National Showcase. The tournament showcased 82 teams on 14 courts all under one roof. The games were tightly contested and players were eager to show the college coaches their skills. So here is the breakdown by division. This division saw two great teams face off early in the games. Nobody knew then but that game would decide the championship. Fever 13U vs. Wolfpack 7. Although the score will read as a 9-point victory for the Fever the game was hotly contested up to the end of the game. The Town & Kon team from Hawaii was fun to watch as their pressing style made the game fast paced and thrilled the fans watching the girls play. In the end, however the two team the separated themselves from the rest were Fever 13U from the Bay Area and Wolfpack 7. This could be a budding rivalry for the next couple of years. The teams in this division were tight bundled and the games provided thrills for those in attendance. 3 teams really stood out in the bracket. Cal Sparks Extreme, Las Vegas Storm, and Town and Kon. 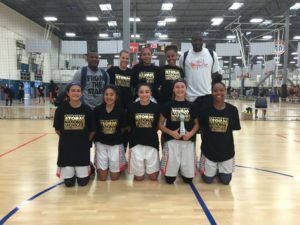 The champion was not determined until the very last game of the tournament when the underdog Town and Kon knocked off the bracket leader Las Vegas Storm by 3 points to give the title to Cal Sparks Extreme. All 3 of these teams were evenly matched and it was great games to watch to the bitter end. Many times in tournaments it simply comes down to who matches up the best against each other. A great division with lots of young players to keep your eye in the future. While 3 out of area teams in Port City, from Northern Cal, Australia Queensland North, and Lead Athletics from Arizona, took turns knocking each other off. The Coastal Elite program powered through their opponents. Coastal Elite dispatched of their closet 3 rivals and captured the title in the division. Their road to the title was not easy as Port City really pushed them until they pulled away at the end of the game. The Australian team hung tough the first 2 days with all comers but seemed to run out of gas at the end of the tournament. Congratulations to the Coastal elite program for a great run in the tournament. This division was dominated by two teams that made their presence felt right away with big wins over good opponents. In the future both these teams will be teams to watch. Fever from Nor Cal and Town and Kon from Hawaii, not only dominated the competition but put up big scores to make it clear that the title would run through one of these great programs. In the final game the two titans of the division squared off and traded buckets early and often only to see the Fever pull away in the end and capture the title with a 4-point victory, 52-48. A great game by two great programs that will have to be considered favorites in next year’s tournament should their teams stay in tack. A lot of close games in this division and the winner of pool A was determined by a single point. Las Vegas 16 National team handled the competition in Pool B before facing the Pool A champion, BBG. The two teams were vastly different styles of play. BBG uses a physical game that does not back down to any team and wants to wear out, while the Las Vegas Storm wants to get out and run. These two teams, with vastly different styles put on a show for the fans in the 5 PM game. 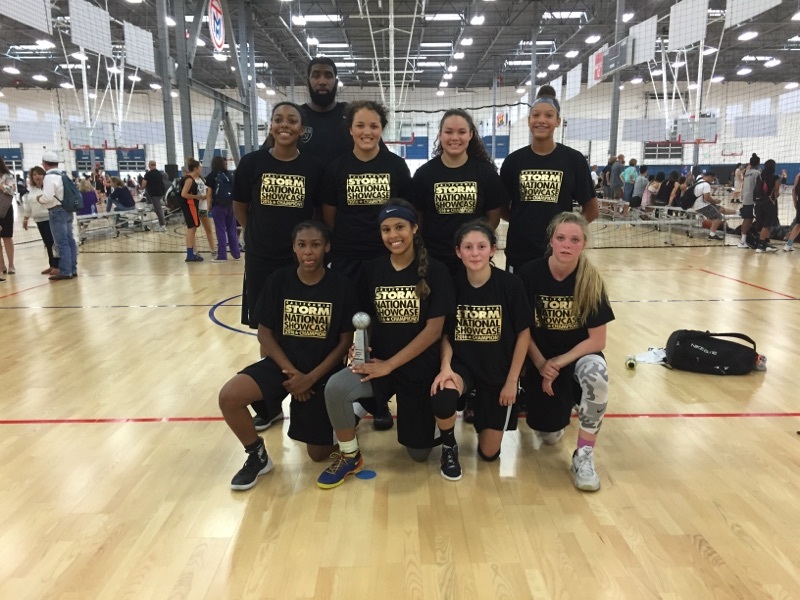 In the end, the speed of the Las Vegas Storm would outlast the tough BBG team 54-48. A great game and two very good teams that deserve a high praise from those who watched them play. Congratulations Las Vegas Storm. Lots of local talent in this pool as the Long Beach Lady Rams brought a big team and looked to dominate inside, while Cal Storm Knights used an aggressive pressing style to force others teams into turnovers. Two of the more interesting teams to watch were the Arizona Premier South team as they had close games throughout the tournament and were in the mix right up till the end and the New Mexico Dream team who played everybody tough and finished with a 4-1 record. In the championship game it featured two teams that are no strangers to each other. 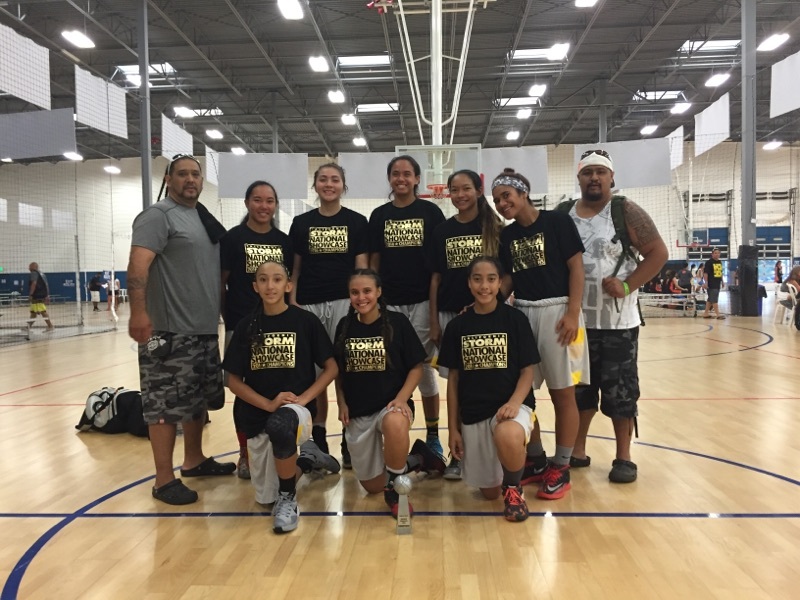 The Cal Storm knights and the Las Vegas Storm. These two teams with very similar styles played a great game with the Cal Storm knights securing a 5-point victory over the Las Vegas Storm. Both of these teams exhibited the depth of their benches in this tightly contested game. 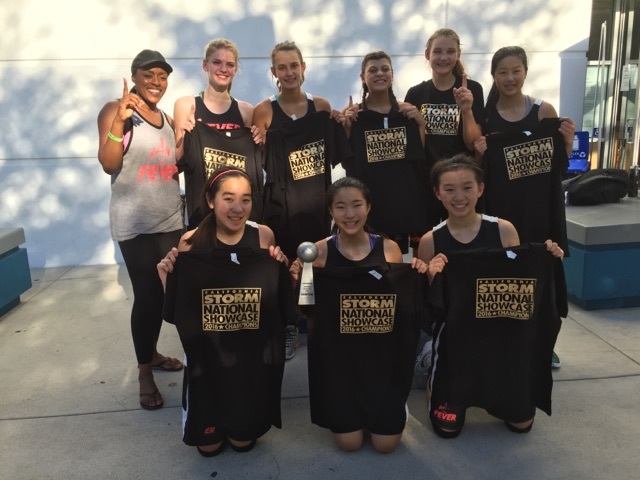 Congratulations to the division champion Cal Storm Knights. The teams in this division had to survive pool play to reach the championship game and the top 5 teams in the division battled tooth and nail. In pool A, the top team was the Coastal Elite 17U. They were able to fight off a very good Camarillo Thunder team that was led by a pair of young guards who are going to be very special in the future. The Coastal elite team was composure and execution of their offense was the difference in a tight game that between the team that would determine the pool champions. In Pool B, simply put it came down to point differential. With two team, Pasadena Swoosh Fury and Nor Cal Lions, tied at 3-1 and Beach City right there with a 2-2 record. The three teams made this one of the most competitive pools in the tournament. In the championship game, Coastal Elite simply was just too much for the Swoosh Fury and secured the title with a convincing win. In the 3rd place game, it came down to the end as Camarillo was able to hold off a stubborn Nor Cal team to claim 3rd place. Congratulations to all the teams in this division. One of the most entertaining division to watch. In a division that had as much of the national flair as any in the tournament, two team were able to take on all comers and end up on top. Port City from Stockton and the Utah Raiders came to town took down all the local teams. Port City had very close games in their pool, holding off the likes of Cal Storm 17Elite, and WCP 15 National team, while in pool B the Utah Raiders, had their hands full the Cal Storm 15 National Team. Utah was able to hold them off for a 2-point victory to secure a spot in the title game. In the championship game, the two out of town titans squared off in a game in which Port City simply dominated. They took control early and the visitors from Utah could not overcome the deficit. Port City proved that they were the class of this division and deserved to win the pool. Congratulations to the Port City for winning the division and to the Utah Raiders for a strong showing. There are many teams that via to gain a spot in the top division but fail to realize that this division is a battlefield, where the faint of heart dare not tread. You can make a name for yourself good or bad. In Pool A, once again, Team Taurasi proved to be the class of the division but there were certainly other teams that were vying for whose next. Cal Storm Bay area and Fever basketball were game opponents until the speed and relentless pressure wore them down. Team Taurasi again had strong play from Aubrey Knight, who will certainly gain national attention at Nike Nationals, and LB Poly star Jasmine Jones. So while Pool A had to deal with Team Taurasi, Pool B was not so clear cut. Balboa Hills, led by the Milner twins, were up to the task. They were pushed by the Cal Storm 16 National Team, and TVT purple who all had the same records. 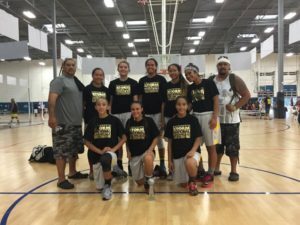 Balboa Hills took the pool by have the better Point Differential and earned the right to see if they could dethrone Team Taurasi. In the end Team Taurasi was just too much to handle and once again walked away with the title. Aubrey Knight was named Tournament MVP and rightfully so. One player who does deserve some recognition is Grace George from the Australian National team. The 6’0 swing player, possess long arms, an uncanny knack to be around the ball at all times, and the ability to finish in a crowd. She quickly drew the attention of the college coaches and was only slowed later in the tournament with a sprained ankle. Certainly she is one to watch as she is only a sophomore!!! Yikes. This tournament, with its international and national flair, certainly attracted many college coaches who wanted to get one last look before all the teams hit the road for that final push. Fans, coaches, and players were all treated to some very high level basketball that showcased athletes that showed just how far the women’s game has come. I tip my hat to all the coaches that trained these special young ladies and they did not disappoint in this high level tournament.